The world’s best Pinot Noir? Pinot Noir has quite a reputation, in ways not shared by the other great black wine grapes, such as Cabernet Sauvignon, Merlot, Cabernet Franc, Syrah, Grenache, Nebbiolo or Sangiovese. It is famously fickle to grow (thin skinned so prone to diseases). Yet it has always held a particular fascination for many growers because, when everything falls into place, it can produce outstanding wine and a market value to match, providing the producer both fame and fortune. But to achieve this, everything has to fall into place, especially because it is a soloist, not a team player, that is, one that could be used (or hidden) in blends – with the notable exception of sparkling wine, which is not today’s focus. When Pinot fails to achieve this degree of perfection, the result is often rather disappointing. It is a naturally quite acidic grape, and this aspect can easily dominate the palate, given that the thin skins usually provide modest tannins and concentration. Much, probably most, Pinot Noir falls into this trap. The disappointment is all the greater because the same glass of wine may be lovely on the nose – this is an aromatic grape (as red grapes go) with a signature of red berries and currants and a smoky undertow which oak ageing accentuates. Yet the first mouthful often reveals a lack of balance and of complexity too. But when everything does work out, something magical happens. The aroma suddenly becomes more than primary, secondary and tertiary descriptions convey, with a quality sometimes described as ethereal, sometimes as haunting. Ethereal can mean light, airy, tenuous, delicate, refined or heavenly, while haunting means not quickly forgotten. I know no better pair of words to describe this impression, and it is carried through onto the palate. Being a scientist, I am quite sure that this all due to some aromatic compound or compounds coming off the wine that creates this particular impression in the brain – but I have never seen any evidence of research into this effect, nor even hypotheses as to what is responsible. If you have never had this experience with Pinot Noir, you are probably in good company. I have only encountered it two or three times, and will identify the most memorable shortly. In the meantime, I have three tips to help direct you towards it. The first is to concentrate on red Burgundy; I have never found a Pinot Noir from anywhere else that came close to possessing this magic in the glass. The second is to think Grand Cru; we are talking top quality here. The third is by now obvious, be prepared to invest! If only it were otherwise (and it once was), but Grands Crus now start at around £100 per bottle – and you will probably need to spend rather more. I tasted them all; why wouldn’t you and when would you get another chance? No disappointments among them. But which of the four Burgundies was it? 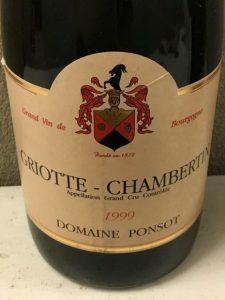 The Ponsot Griotte Chambertin 1999. Haunting it was: I could smell the wine when I woke up the next morning (not on my breath of course, but in the brain), and still can. And ethereal. I looked up this wine in cellartracker.com, to see if other tasters agreed. The nine ‘community tasting notes’ were very variable in their verdicts, which ranged from ‘quite rustic’, ‘the aftertaste is not that long’ and ‘good but not great’ to ‘mind blowing aroma of celestial, ripe cherry liqueur’, ‘superb, pure, mouth coating fruit and beautiful acidity’ and ‘every little thing is so balanced’. One wonders whether all these bottles were in good condition. Just one picks up on the ‘mind blowing aroma’. The professional tasting notes on Cellar Tracker are all hidden behind paywalls but some find their way into merchants’ notes. Allen Meadows (Burghound, Jan 2015) noted ‘strikingly perfumed’, ‘outstanding complexity’ and a ‘gorgeously persistent finish’. Laurent Ponsot is of course a much admired Burgundian winemaker. Griotte Chambertin is only one of his holdings; elsewhere in the Côte de Nuits he has vines in Chambertin-Clos de Bèze, Clos Saint-Denis and Clos de la Roche, plus others, and Corton-Bressandes in Côte de Beaune. His vineyard and winemaking practices have been called idiosyncratic, but that is both unkind and inaccurate. He favours low intervention, including many organic and biodynamic practices, avoiding use of sulphur dioxide and using only old oak. Further fame came when he flew to the USA to intervene in one of Rudy Kurniawan’s auctions of fake wine, and a second time as a witness at his trial in 2013. As of 2017, Ponsot has now stepped down from his estate and started a new négociant business with his oldest son, Clément.